Give your team the opportunity to form a committee to spearhead philanthropic efforts. Bringing people with unique ideas together can result in an enjoyable experience for your team! 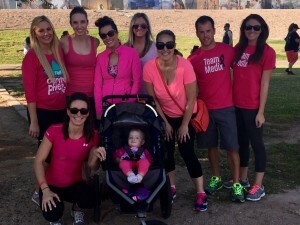 For example, a committee of Medix teammates formed to lead our efforts in Breast Cancer Awareness Month this October. They got involved with the Making Strides walks and came up with fun ways to motivate the rest of the Medix team to donate and spread awareness. As a result, the Medix team is closing in on our donation goal with a week to go! Contests are a great motivator! Whether it’s a contest for raising the most money or anything action-based, you will get your team’s attention – especially those with a more competitive spirit! Make sure you keep everyone engaged by regularly updating the team on the contest standings and follow through with the rewards. When you tie your philanthropy in with day-to-day functions at work, it stays in the forefront of your team’s minds. Medix participates in Movember, a philanthropy that challenges men to grow mustaches during November to spark conversation and raise money for men’s health programs. Participating teammates commit to raising a certain amount of money and then grow their mustaches. We then create cards explaining the philanthropy, so our sales team can spread the word to our clients during their meetings. Trust me – it’s hard to miss those masterpiece mustaches, so they inspire many conversations! Regardless if you’re a large or small organization, it’s a good idea to give back to your community. Keep an eye out for a nearby event or a school fundraiser to share with your team. Motivate them to work with these local causes to supplement the work with the larger philanthropies. Getting your team involved together in philanthropy is a great team-building opportunity. Use the fast-approaching holiday season as a way to get your team to lock arms behind a great cause! This entry was posted in Clients and tagged charity work, Company Philanthropy, corporate social responsibility, Philanthropy. Bookmark the permalink.